Passport Reader 303 takes both normal (white) and infra-red (IR) images with 200 PPI resolution, and use fast image taking and processing method and reliable OCR operation. The device is able to read the most popular chips used in the new generation ePassports. 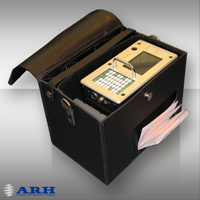 Its structure, the optical characteristics, the built-in industrial computer and the comprehensive functions library make Passport Reader 303 a considerable and cost-effective solution for any application where mobility, high quality, robust and compact construction is a must.